The National Security Inspectorate (NSI) is the flagship accreditation for the security industry, providing high quality audits of business security and fire safety service providers. This ensures that we work to the highest industry standards and are monitored twice year for the quality of our workmanship, office processes and financial health. 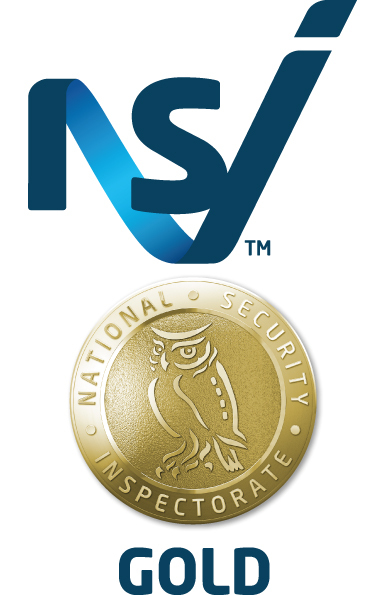 NSI Gold means we provide reassurance to our chosen contractors that we work to high standards and provide benefits to our customers insurance costs. For example, certain insurance companies will only give you coverage if you have NSI approval. Additionally, if the company who install your intruder alarm are not certified by NSI or similar, the police wont respond to your alarm. NSI services are continually being adapted and developed to ensure that we are keeping up to the highest standards of the sector. · NACOSS Gold companies also meetindustry specific ISO 9001 Quality Management System standard requirements. As part of the management certification, Omega is ISO 9001:2015 accredited. This is designed to help organisations ensure that they meet the needs of customers an other stakeholders while meeting statutory and regulatory requirements related to a product or programme. This ensures that we deliver good quality products and services in customer focus, motivation of top management and continual improvement. Omega are accredited through an existing SSIP for environmental accreditation, however we will also be working towards the environmental 14001 accreditation in the near future. This accreditation provides the tools for companies looking to manage their environmental responsibilities.